The sky was grey, the air warm, and the atmosphere thick with rain in the near future. I vividly remember the first 5K race I ever took part in. My ex-wife’s father was an avid runner; we’re talking about the distances such as half-marathon and marathon. At this point in life those were distances that made zero logical sense to my own cerebral cortex. Why would someone want to run that far? Why would anyone want to run, period? The course, my first 5K, took place along the bluffs of the Missouri River in the state capital of Jefferson City, Missouri. Though it had been advertised as a ‘novice course’, it became clear along the steep grades that this course may be more towards the individuals of the…professional level. It was a horrible experience. I walked nearly half of that course, and I remember the frustration of thinking how this family would judge, how I couldn’t catch up to the guy whose daughter I was in love with, how I was once a joke of a runner and that I would always be that joke of a runner. I had dry heaves following this event. My first 5K, in the rain, with a balmy time around 52:00.00. The purpose of the story-within-a-story was to lay the framework of a tragic beginning relationship with an adventure that I would have never been able to predict. For the past 90 days I’ve been focused on one specific goal with training and health; running 3.1 miles (a 5K) under 20:00.00. The one consistency, whether at the gym, on the trail, or the road is that I log right at 30 miles of movement per week. I needed to create a base of mileage from which I could begin to focus on specific areas of improvement (speed, cardio, stance, etc…). Today was the 90th day of this project. Today, at approximately 5:00 PM CST, I strapped on my shoes, running shorts, technical shirt, and took off for what I thought was going to be a brisk 6.2 miles. Mental Conversation: Turn right at the top of the street; go through the intersection. Stretch out the legs to get a feel for the asphalt. Breathing is relaxed, calm, and the strides are in line. No overpronation noted, not running on the sides of the feet. Keep the breathing calm. Focus. Music. Look for dogs briefly. Fix shorts. Turn right at the T-intersection, take a sharp right out onto the highway. Little traffic, hit the hill. Calm down at the peak and stretch out on the flat. The cows are running with me on the side of the road. Wave to cows. I think I started too fast. I’m moving too fast at the moment. No time to recover, keep stretching out the legs. Push up the incline. Feel the potential side stitch. Deep breath, raise the whole body with each breath. Corner is up ahead. Keep pulling through with long strides. Weather is nice. Wind is from the south. Sun feels nice. Gear feels good. Up the hill and turn right. Look for cars. Keep right, dodge left when able to see downhill. Let loose. Stop resisting downhill and let your body catch you. Pick up speed. Keep the momentum, stretch up the hill. Hamstrings are fine. No tightness, no tension. Keep breathing. Keep moving. Keep breathing. Pull farther up the hill. Hit the sign. Hit the sign, stop the clock. Hit the sign, 3.1 is met. Hit the sign, stop the clock. Embrace a 25:00.00-26:00.00 3.1 with success. That is success after a long week. Look at your watch. Glance down at your watch. No 26. No 25. No 20. 19:10. 19:10? 19:10! I have a goal. There is a specific race in a few months that I want to win; literally win. I doubt I can, to be truthful, but then again I never thought that I’d ever be in this position in my life. In six years of chaos, change, and ongoing struggles I’ve shaved off over thirty minutes from that first 5K on that rainy day. God is so good for allowing me to move my legs every day in this crazy life. So many things I could look into the future from my past self and not be overly surprised of taking place, but running? The concept of muscle movement in a form of worship to God is something that I would have never imagined. I hope that this is only the beginning of something incredibly beautiful. I was trolling through old posts and I started collecting the links to the past Christmas/New Years recap post that I’ve made over the years (a whopping two to be exact). Needless to say, like Waffle House at midnight on Christmas Eve, some traditions just have to continue. I’m just over a week into being an official teacher inside the school I’m currently with. It’s been a whirlwind of a month; from teacher orientation, room design and construction (literally), to the very first day of school. It’s easily a thought that I’ve processed on multiple days, but have concluded that the battery life in my keyboard wouldn’t last long enough for me to type out all of my thoughts in relation to this amazing experience. The clock never felt so alive. I’ve completely lost track of time down in southern Missouri. I’ve given up on tracking the days and instead I’ll just go with the flow. The group had a unique opportunity on Tuesday. Down the road is a city called Poplar Bluff. Here one can find a halfway-house situation for women recovering from addiction (addiction to drugs and alcohol is a serious pandemic in the area). We have several female youth with us, and they were beyond thrilled to be able to work with this home called “Recycling Grace”. A few ladies were kind enough to share their stories, and a few hugs, with the group. 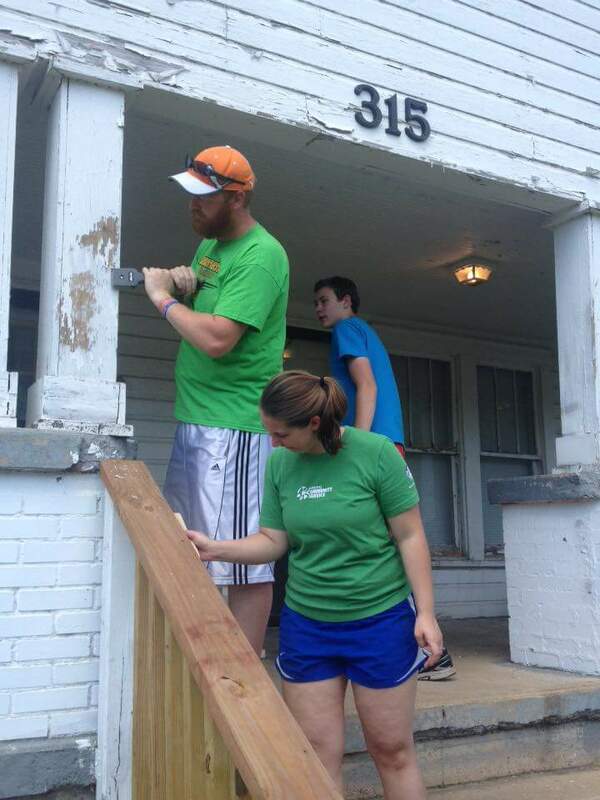 At “Recycling Grace” the organization has been allotted several rental properties throughout the community. Our crews main task was to work with paint scrapers and wire brushes on the porch of one of the rental properties. To show you how skiddish some people are, we had started on the porch of this duplex when this woman, in nothing but a towel, steps outside in broad daylight fearing she’s being robbed by us (paint scrapers near windows do that I suppose). I’m still amazed at how easy it is to pack up, grab a passport, and disappear to another country as a missionary, when in so many ways, the same problems plague our own communities. We’re mulching again tomorrow. The heat hasn’t stopped us yet. It’s not even 6:00AM on Friday morning, and I’m staring at the ceiling. Like all good things, this trip is drawing to an end. Last night was one of the more humorous events of the entire week. Armed with a snow-cone machine and some giant, neon poster boards, we took the crew to the local baseball complex. Simple. Give away free snow-cones. Darco, armed with syrup pumps (funny how God uses barista training), started dishing out the cones. The rest of us vanished into the streets and parking lots letting people know about the opportunity (note: growing out the beard has one drawback…a grown man with a beard, telling kids about free snow-cones at a park…borderline creepy). In total we served up 250 snow-cones, made several new friends through the kids showing up, and were thoroughly blessed by cooler weather and a nice southern breeze. This was a nice change up from the 102℉ we witnessed while throwing mulch on Wednesday. Interesting factoid though, our group was able to successfully disperse all mulch to all playgrounds throughout the school district. With no heat sickness, and no injuries with the pitchforks being used. That’s rather impressive in my book. Personally, I get so much joy doing physical labor as a service. I’m thinking that’s because I’ve been going that route on missions for years. It’s 6:00AM, time to shower, eat, pack, and hit the road. Humans are officially one of the biggest, hottest messes to exist this side of the galaxy. This is what I’ve come to believe over the past week; namely taking cue from my own social existence.